Danny Amendola #80 of the New England Patriots celebrates his touchdown against the Buffalo Bills during the first half at New Era Field on Oct. 30, 2016, in Buffalo, New York. The thought of retiring after last season, going out on top with the second Super Bowl championship of his career, never occurred to Patriots wide receiver Danny Amendola. 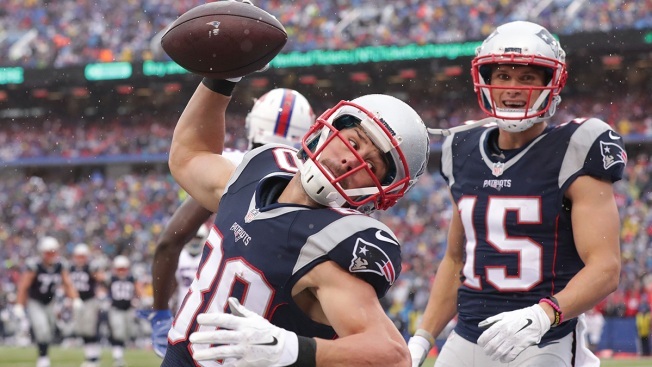 "I still have more to play, man," Amendola said Monday. "My body feels really good. I feel the best I've felt in a long time. So I'm excited to get out there, get some more reps, get some plays into the preseason and go from there." The thought of playing for another team never occurred to him either. So much so that Amendola took a pay cut — for the third straight season — to stay in New England. "I love playing for this city, I love playing for this team, I love the atmosphere coach (Bill Belichick) brings when we walk in the building every day," Amendola said. "I want to play good football, I feel like this is the place where I'll be able to challenge myself and play the best football I can. Ultimately, that's why I'm here." That's also why he spent part of the offseason working out with quarterback Tom Brady and fellow receiver Julian Edelman in Montana. "It's a lot of good work out there. It's high altitude. Oxygen is a factor," Amendola said. "Anytime you get to get extra reps or just work on your craft is good. That's why we're here." Entering his ninth NFL season and fifth with the Patriots, the 31-year-old Amendola knows there is still work ahead of him. After recording eight receptions for 78 yards, a touchdown and a two-point conversion to tie the game with less than a minute left in regulation of the Patriots' overtime comeback win over Atlanta in the Super Bowl, Amendola is listed behind Edelman, Brandin Cooks, Chris Hogan and Malcolm Mitchell on the team's wide receiver depth chart heading into the season. He has been limited for unspecified reasons in recent practices, including Monday, the first of three joint sessions with the Jacksonville Jaguars, before the teams play their preseason opener Thursday at Gillette Stadium. After Amendola missed all of the 2016 training camp as he recovered from ankle and knee surgeries, the team is just trying to be cautious, he said, keeping him healthy for the long haul. "Sometimes the coaches do a good job holding me back," he said. "If I were to get out there too soon, or if I wasn't ready, or if I had something that was bothering me a little bit, I would play through it and sometimes it would make things worse. I feel like pace is a huge part of being successful through preseason and then on into the season. I like to go full speed all the time. Sometimes it's good to, right now, I'm kind of easing into it and getting ready. "The main deal is just to be ready for the first game of the year and have my body ready to go. That was just the idea. The plan was never set in stone but having the ability to adapt and come out here and get work every day and get better every day is the goal."